Bottom from left: Audry Brassil, Tori Emerick, Elizabeth Fry, Kelsey Syms, Tayler Bates, Chrystal Tullis, Kailey Wilt, and Addy Gage. Middle left to right: Coach Brian Gallagher, Bryce Ervin, Lisa Hart, Lauren Lichtenberg, Colby Werley, Lena Friesen, Josie Potts, Luke Verst. Top from left: Gus Kimball, J.T. Sutton, Adam Potts, Logan Johnston. 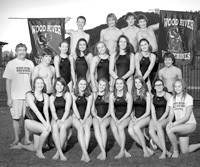 After bringing home a seventh regional victory in Pocatello last weekend, Wood River High School girls will lead the way to Boise this weekend to defend their state title, five years running. "More swimmers have come out over the last couple of years," said coach Brian Gallagher, commenting on his team's success. "It's about the kids' hard work. The ones that have come on have really dedicated themselves to the sport every day." Swimmers who have qualified to compete in the state meet are Tayler Bates, Tori Emerick, Bryce Ervin, Lena Friesen, Elizabeth Fry, Logan Johnston, Gus Kimball, Lauren Lichtenberg, Adam Potts, J.T. Sutton, Kelsey Syms, Chrystal Tullis, Luke Verst and Colby Werley. The district meet last weekend provided an exciting preview of what is to come at the state meet with the women's relay teams taking first place in the 400-yard freestyle and 200-yard medley. The men's relay team claimed a second-place finish. "Relays are swimming really well," Gallagher said. He said competition in Boise will be tough this year with swimmers from 61 teams from around the state competing. "State swimming championships are not broken down into classes," he said. "If you win state in [a swimming event], you win the whole state." Lena Friesen, a sophomore, will be defending her freshman year title as 200-yard individual medley champ. Friesen will also be arriving at the state meet as the No. 2 swimmer in the 100-yard freestyle. Elizabeth Fry is a favorite for the 500- and 200-yard freestyle. J.T. Sutton is a contender for boys' sprinting events and Adam Potts is the team's strongest distance swimmer. "The girls are for real," Gallagher said. "They want to be on top." Swimming fans can catch the action in Boise on Friday and Saturday, Nov. 5-6, at the Boise City Aquatics Center, 5959 North Discovery Place, which is west on Chinden Boulevard adjacent to the West Boise YMCA.